Timeless modern, elegant suspension lamp from the designer Arne Jacobsen. Recommended light source 1 x 100W A60 matt E27 (not included). AJ Royal is state-of-the-art. As the name already reveals, the AJ Royal Pendant Lamp is a design by the Danish design expert Arne Jacobsen for the Radisson SAS Royal Hotel that was inaugurated in 1960. Arne Jacobsen did not only plan the building, he also designed the whole interior furnishing, among others including furniture, cutlery, textiles and lamps creating the first design Hotel of the world. As many of those products (such as the “Egg” and “Swan”), also the pendant lamps became legendary Scandinavian design classics. The AJ Royal Pendant Lamp concentrates the light to where it is needed without disturbing dazzling. The half-sphere shape lamp’s housing whose functional form is emphasized by the graded lamellae at the upper end, where a soft, upwards lead light shines, consists of aluminium. Its surface shines white and wet-lacquered. 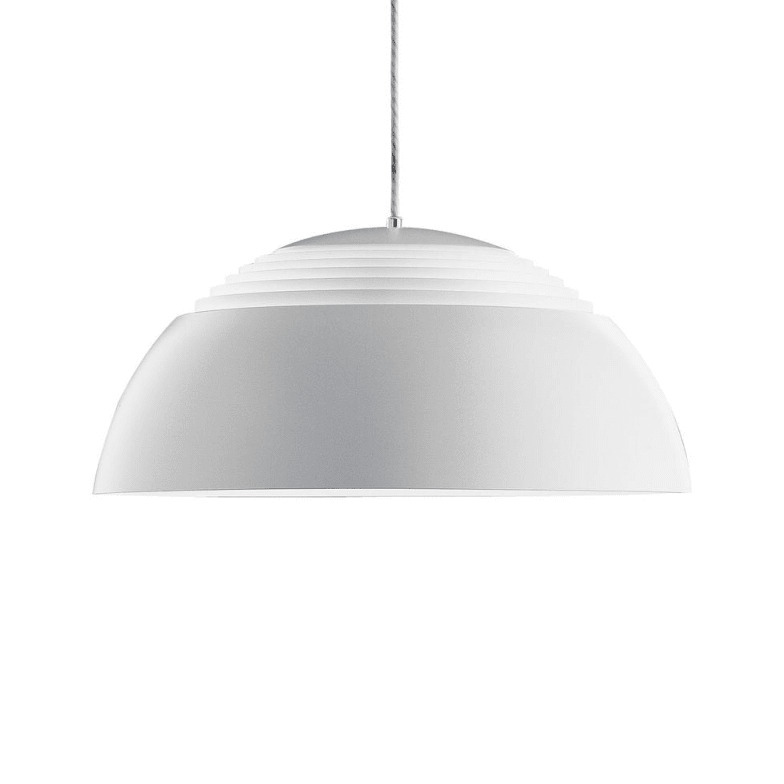 The rings of the Arne Jacobsen designed and Louis Poulsen produced AJ Royal Pendant Lamp are made out of steel. Do you have a question about "AJ Royal"? How can we contact you?